Good to see you post, Larry. Sounds more like air sickness. stdavidecho suggests " Marmite" , and I'm inclined to agree. Not even gulls will eat that. 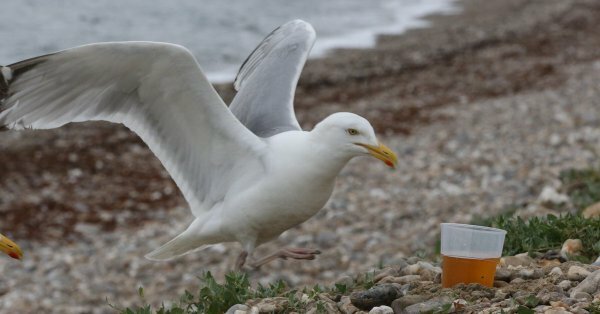 Seagull vomit stinks whether they drink beer or not. Damn, I wish I didn't know this. Incidentally? Forget red telephone boxes and the queen and high tea, THIS is basically the definition of Peak Englishness. it’s been reported seagulls have been “getting drunk” after feasting on flying ants. And you know they're drunk because they become loud and belligerent. At our house the robin's get drunk eating fermented holly berries. I wish I had holly berries for the birds. As it is, they steal my currants, apples and grapes. "Bones Unearthed On ABQ West Mesa Are Ancient, Pearce Has Pile Of Cash For Governor Race"
Dammit, Jim I'm a doctor, not an archaeologist!